We are leading Manufacturer of Brass Stud and our product is made up of good quality. Backed by huge industry experience and market understanding, we are involved in offering a wide array of Brass Fasteners for our valued patrons. With enriched market experience, we have been able to offer a wide spectrum of Brass Fasteners. 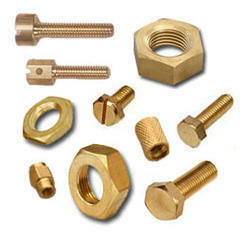 We are the leading manufacturers of Brass Fasteners. Aimed at a prosperous growth in this domain, we are instrumental in offering an excellent quality range of Brass Fastener. Our modern infrastructure equipped with advanced equipment, helping us to manufacture Brass Fasteners. Price : Approx 450 Rs to 550 Rs per kilogram as per quality and size.